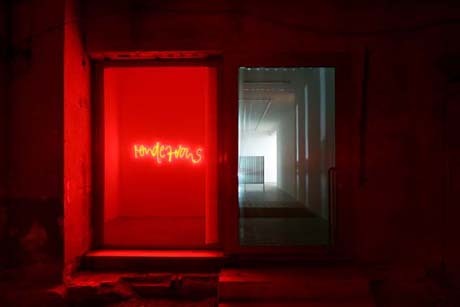 Riccardo Previdi’s first solo show offers the opportunity to welcome Francesca Minini’s new space in Via Ventura, the area of the town characterised by the most rapid increase in art galleries’ density. “C’etait un rendez vous” takes its name and its conceptual fundament from a Claude Lelouche short film portraying an unknown driver’s unreasonably fast car ride – presented in first person – through the streets of Paris that ends with an embrace between the daredevil and a girl. A romantic encounter that, supposedly, caused and justified the crazy rush. The nine minutes footage is projected in its integrity on a panel furrowed by regular vertical cuts so that the exceeding light spreads on the surrounding walls and welcomes the visitor together with the original soundtrack consisting only of the noise generated by the director’s Ferrari 275 GTB. 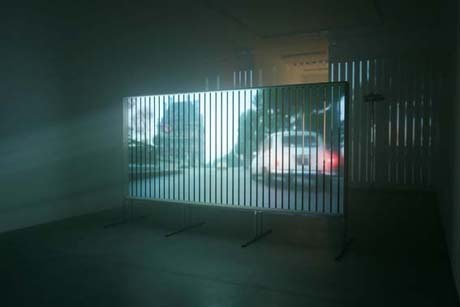 The installation also hosts a red neon sign spelling the name of the film; a red tubular structure that terminates with a light-bulb on each side and translates in the form of minimalist sculpture the trajectory of the car through the streets of the French capital; a series of black and white photographs in which the face of the subjects is hidden by white circles – a parallelism with the hidden identity of the car driver, the director himself or a professional pilot? – and a double image of the glamorous icon Brigitte Bardot put at the very end of the exhibition. The show relies on an engaging and finely conceived work of permutations on the Lelouche footage: Previdi uses the film as a starting point to create formal affinities that allude to modernist art and design, playing with the underlying cultural traits that inform the experimental short. 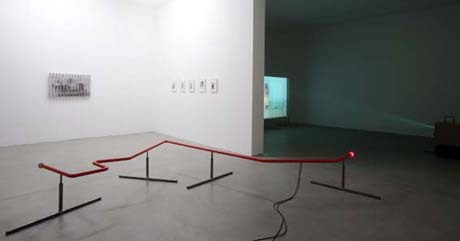 The cult of speed, self affirmation through indifference to risk taking, the urban landscape interpreted as an exploratory field and transgression (the work of Claude Lelouche was immediately banned by French authorities) are hardly new concepts in both art-making and popular culture and Riccardo Previdi employs them to create a rich and satisfying grid of crossed references.